California ground squirrel (Spermophilus beecheyi) in the man-made rocky shoreline of the Berkeley Marina: The numerous crevices offer safety and shelter. Ground squirrels are marmots. These are small rodents, squirrels which live on and in the ground. Most of them live in the mountains, like the Sierra Nevada, or the Alps. Marmots make holes in the ground. They live in burrows, underground. They hibernate, that is they sleep through the winter. Marmots are very social animals. They group together easily. They also like to communicate with each other, with whistles, especially when they sense danger. They vary in size and habits. Most are able to rise up on their hind legs and stand fully erect comfortably for long periods. This way they watch for predators. They tend to live together more than other squirrels, and many live in colonies with complex social structures. Most Marmotini are rather short-tailed and large squirrels. 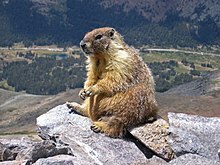 The Alpine marmot (Marmota marmota) is the largest living member of the Sciuridae, at 53–73 cm in length and weighing 5–8 kg. Many historians suggest that marmots, rather than rats, were the carriers of bubonic plague epidemics in the Middle Ages. Wikispecies has information on: Marmota. This page was last changed on 8 March 2017, at 10:11.